Route description: From a parking area just below the treeline, continue along the road until it ends on a flat area at the top of the first distinct slope above the treeline. 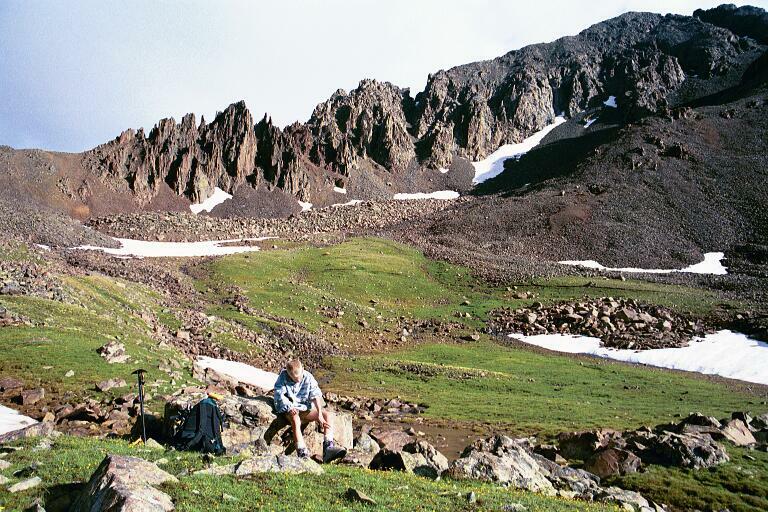 From here, hike on a level trail towards the impressive, jagged ridge coming down from Mount Sneffels. There is a trail junction with a sign, one trail going straight ahead towards Blue Lakes (as well as the base of the Sneffel ridge route), the other trail turns right and heads up a long, moderate slope with scree and talus. This slope leads to a col between Mount Sneffel and its neighbor Kismet (4174 m). There are reasonable trails climbing this slope. Once in the col, there is a large couloir heading directly from the col to the left towards the summit of Mount Sneffels. (There is another couloir further on, starting a bit down on the other side of the col, do not take this couloir.) The couloir is easy to climb, when we did this climb it had almost no snow left. However, earlier in the summer one may consider bringing an ice axe and crampons, depending on the conditions. Climb this couloir essentially to the top, about 5 meters from the top there is a very distinct, quite narrow V-shaped crack on the left hand side. Scramble through this crack and find a very flat and easy area on the other side. From here, scramble (easy!) along or slightly left of the ridge to the summit. The summit is level, but not huge. The view of the rough, surronding ridges to the west and of the large, flat land to the north is breathtaking. 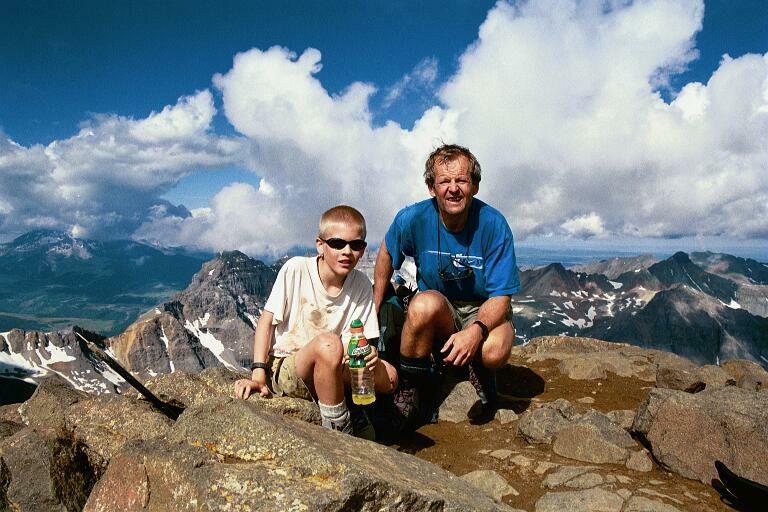 Comments: I did this climb with my son Pål Jørgen, age 12. 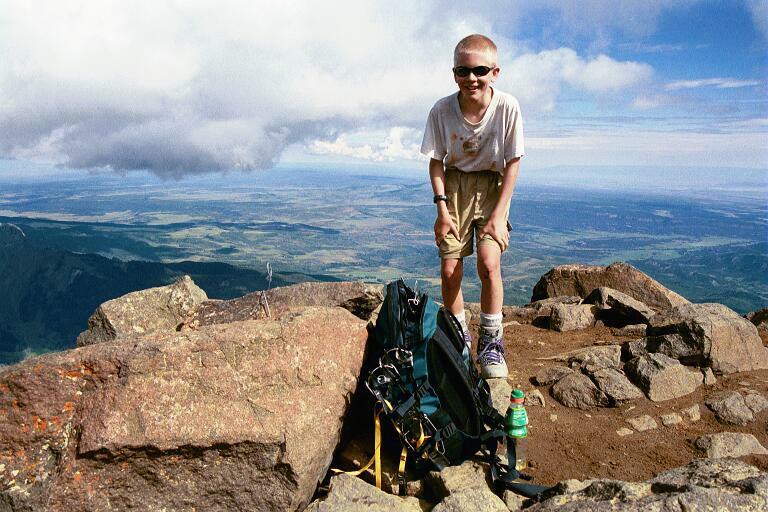 We had good sunshine on the summit and truly enjoyed the view and the summit. We left our Jeep at 0720, arrived at the summit at 0940. After a long rest on top, we started descending and were back at the Jeep at 1150, a total time of 4.5 hours. 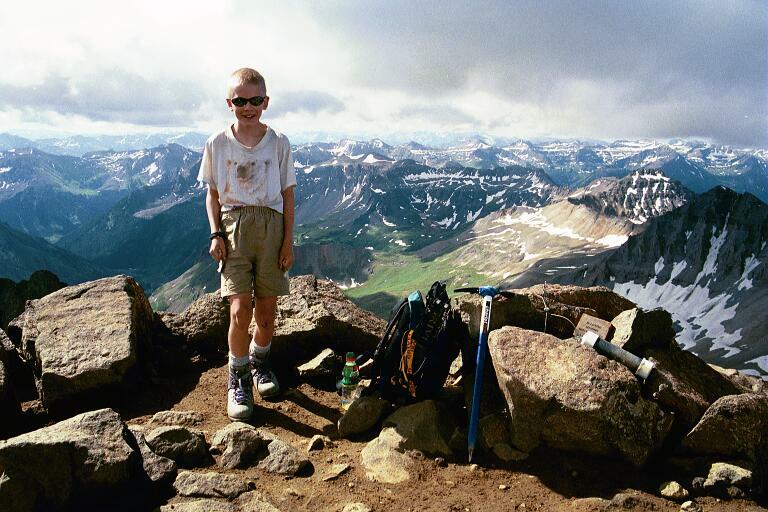 On the summit of Mount Sneffels. 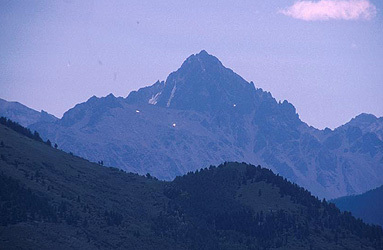 The South-West ridge of Mount Sneffels. View north from Mount Sneffels, the San Juan ends here. View west from Mount Sneffels, this is a very nice summit. 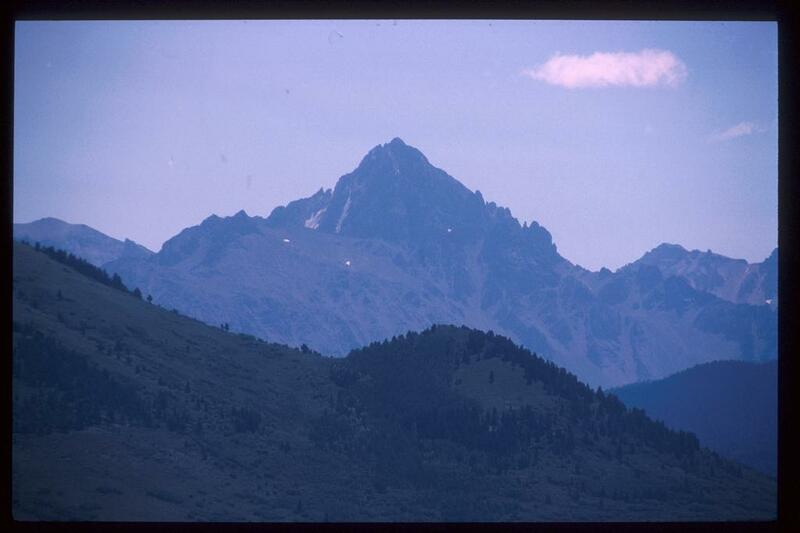 Mount Sneffels, as seen from the highway on the north side.